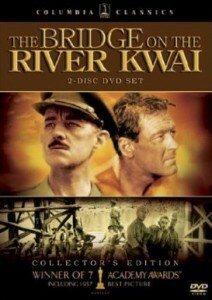 A British colonel, taken prisoner by the Japanese, builds a bridge for them and in the end even gives up his life trying to save it, so obsessed by pride in his work that he has forgotten it will serve the wrong cause. Sounds familiar… Hmm. For more details, see tt0050212 on The Internet Movie Database.